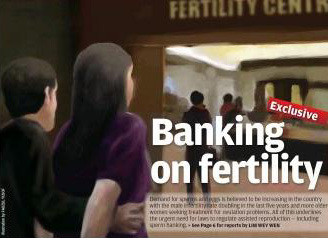 Infertility is a growing problem in Malaysia and in other countries. The Star newspaper recently reported on its front page that the demand for sperms and eggs is believed to be increasing in the country with the male infertility rate doubling in the last five years and older women seeking treatment for ovulation problems. Based on published data, a high percentage of infertilities are perceived to be due to hormonal imbalance. As such, doctors would treat this problem through a plethora of methods such as prescription of fertility drugs, artificial insemination, in vitro fertilization (IVF), GIFT and even medical procedures to unblock fallopian tubes. However, the root cause is often overlooked and left unaddressed. The misguided approach in treating infertility, meanwhile, creates tremendous stress and frustration for ‘parents-to-be’. Often, due to the overwhelming desire to have a baby and the cultural pressure of having to produce an offspring to continue the descendants’ line, ‘parents-to-be’ tend to disregard the potential risks of a forced conception through drugs and infertility treatments; overriding the body’s innate intelligence. Is infertility a medical problem? We observed from our CLT crystal healing experience that the human body is far more intelligent than our intellectual mind. Infertility, often misconstrued as being a medical problem, is in fact an indication from the body’s self-organising mechanism that the body is not ready for conception. When the bio terrain or internal environment for conception is not conducive, it may endanger the mother and the would-be baby. Just as there are laws in place to govern the order of life, there are natural laws that regulate the human body. When humans breach these laws, for e.g. via unhealthy lifestyle such as poor nutrition or engaging in excessive energy-depleting activities or inducing pregnancy through artificial means, the resulting pregnancy may suffer from many pitfalls. A miscarriage may result or the child could be born with some dysfunctions or deformity or a compromised constitution. From our crystal healing insight, the ‘parents-to-be’ do share a joint responsibility in improving their fertility by preparing their body’s bio terrain. To quote a case in support of this insight, we have a practitioner who could not conceive for a period of two years. She and her husband tried almost all the conventional treatments, except artificial insemination and in vitro fertilization, but to no avail. Instead of continuing to surrender control to medical interventions, they decided to reclaim their power. They embraced a different healing protocol, which harmonises with and supports the body’s innate wisdom. This protocol encompassed detoxing and strengthening their bio terrain by adopting a strict dietary regimen. Basically, the dietary regimen removed debris from previous dietary habits which might have acidified the bio terrain, inhibited the absorption of nutrients and at the same time, impaired the interconnected body systems. Then, it is followed by replenishment of nutrients to repair and rebuild biological functions for a conducive environment for conception. Aside from dietary measures, she also conserved her energy by resting more and staying calm. Within six months, she was blessed with a baby boy! Adhering to the same regimen, the practitioner had her second child three years later. The inference is that a healthy bio terrain is a precursor for a healthy and safe pregnancy. While supplying the physical building blocks with healthy nutrients for a solid foundation; adequate hydration, exercise, regular deep breathing, quality sleep/rest are the essentials too. The quality of these prerequisites has been compromised by the depletion of minerals and contamination of the environment under which they exist or are produced. 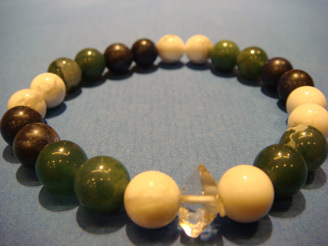 In view of this ever-present shortfall, Heaven’s Gift has formulated a special therapeutic combination of crystals, to be worn in the form of a bracelet to energetically strengthen the foundation of health for bringing forth a new life. At the same time, crystal healing may be administered when an acute condition warrants additional energy support to turn the situation around. This article is intended exclusively for informational and educational purposes, and not for medical advice. It is based on data collected from our healing experiences, observations, inference, positive feedback received, and literary research. We shall not be liable or responsible for any loss or damage allegedly arising from any information or suggestion in this article. This is only symptomatic healing. One must follow through the necessary strict health care measures. If you have a condition that requires medical supervision, please consult your doctor.